Click on the 'Archive...' link to see the Jan. 27th webinar. USFS WNS Brochure Updated April 2016. USFS Interagency Team Mobilizing to Tackle WNS - Caver contributions acknowledged. The Battle for Bats! - WNS video -- Share it widely! NPS WNS Video - Great Smoky Mountains NP Click your connection speed to view. 2009 House Congressional Hearing on WNS - Includes links to NSS and all other testimony, video, photos. 2009 Senate Hearing on WNS - Includes photos, testimony, and complete video transcript. 2011 WNS Advocacy in Congress - Details of the 2011 WNS research budget testimony, prepared by a coalition including the NSS, and presented by BCI. 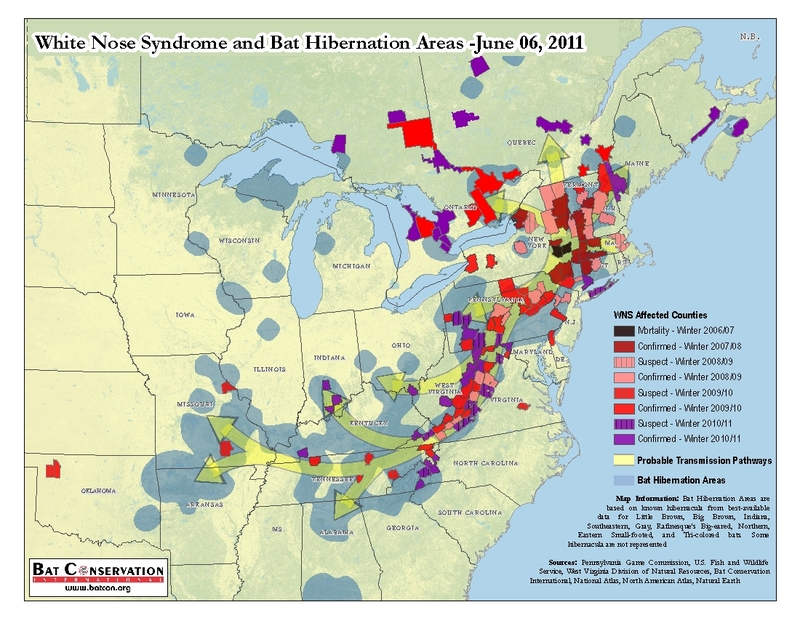 Congressional Hearing: "Why Should We Care About Bats?" - June 24, 2011. An intriguing look at the march of WNS and the significant areas still at risk. A good summary of the WNS situation. WNS news, info, photos, protocols, planning, research, and monitoring. A historical record of information previously posted to this site.